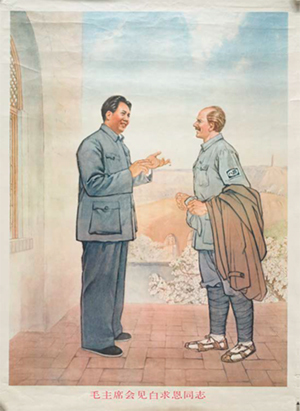 Chinese Poster of Bethune meeting Mao, ca.1976 (unattributed). Osler Library (Norman Bethune Collection), no. OPF000216. Dr. Norman Bethune (1890–1939) is arguably Canada’s most famous doctor. Born in Gravenhurst, Ontario, in 1890, Bethune received his medical degree from the University of Toronto in 1916. Diagnosed with tuberculosis in 1926, his eventual recovery inspired an interest in thoracic medicine, and he moved to Montreal to work as an assistant to Dr. Edward Archibald of the Royal Victoria Hospital, a world authority on tuberculosis. During the next few years, Bethune became famous for his treatment of tuberculosis patients at the Royal Victoria Hospital and the Hôpital du Sacré-Coeur, and for his development and improvement of a number of surgical instruments. Increasingly disillusioned with the general state of medical practice, Bethune advocated for the socialization of the health care system. In 1936, he volunteered to help the Loyalists in the Spanish Civil War, where he organized the first mobile blood-transfusion unit, and two years later he went to China to help the Red Army. He died of blood poisoning while operating with the Chinese Eight Route Army, in November 1939. Bethune was lionized in an essay by Mao Zedong for his selfless dedication to others and continues to be admired in China and around the world. He has been the subject of numerous biographies and films produced in Canada and elsewhere. The Norman Bethune Collection contains correspondence to and from Norman Bethune (including copies of many letters between him and Frances Penny, who he twice married and divorced); and examples of his medical and political writings, such as material produced with the Montreal Group for the Security of the People’s Health during the 1930s. There is also a great deal of Chinese and Canadian secondary material from the 1960s and 1970s that document the growing interest in Bethune. This includes newspaper and magazine clippings and other writings, an original play about Bethune’s life, a documentary script, and various memorabilia (e.g. commemorative stamps, brochures, pamphlets, buttons and pins, posters, and fliers). McGill holds other archival fonds and collections of Bethuniana: the Roderick Stewart Fonds contains research material collected by Stewart, author of several Bethune biographies, including recorded interviews with many of Bethune’s contemporaries; the Bethune Foundation Fonds and the Louis and Irene Kon Fonds both document attempts to revive Bethune’s memory in the 1960s and 1970s.